Frank Cullen and Jerry Crilly in May 2013, at the exhibition of my urban reflection photographs organized by the Irish Fulbright Commission. Photos of Jerry are by my family member, Dave Chance. See a full set of photos from the 2013 event by clicking here. You may recall my friends Jerry Crilly and Kevin Donleavy. Both have dedicated their lives to Irish music, Irish history, and the pursuit of social justice. On my first visit to the Cobblestone pub in Smithfield (Dublin 7), I met Jerry. That was back in 2012, and he soon asked me to find his pal Kevin who had moved to Virginia. It wasn’t long before I located Kevin in Charlottesville. On my visit to Virginia for Christmas that year, I brought Kevin a vinyl record, sent by Jerry as a gift. You can read more about that in a blog I posted long ago. The record had a lovely cover and contained songs by Rakish Paddy, one of Jerry’s musical groups. Jerry was also at my photographic exhibition and my American wake so there are many blogs on this site that include him. He was a dear, sweet man, who never failed to mention the importance of his partner Deirdre in his life. Jerry’s health has been declining over the past few years. I haven’t gotten to see him much as he rarely traveled as far as the Cobblestone at night. I did make a trip down to the south of Dublin, to visit the Bottle Tower one night so I could hear a musical gig organized by Jerry. It was enjoyable, but as these trad sessions didn’t start until 9:30 PM and ran on school nights, they weren’t very accessible to me. Jerry Crilly in May 2013. Sadly, Jerry’s health got the better of him, and he recently passed away. Kevin has kept me informed of events, and forwarded on these details sent by Jerry’s beloved partner, Deirdre. Jerry had a lovely send off today. Everything went smoothly. We had a folk mass in the church that was beautiful. Then in the crematorium we had Jerry singing “John of Dreams” from the Rakish Paddy cd as we entered followed by his great friend Pat Ludford from Cornwall sing “Fields of Athenry” & for the final curtain his dear friend Julie played on flute “The Jerry Crilly Jig” kindly written by yourself & she did it a great justice. I so wished you could have been there to hear her play it was so lovely. Then we went back to the Ballinteer House for food & a fantastic session from musicians from all over. Eric Fleming who was in Jerrys group the Connolly Folk & Brendan Leeson the last member alive of the Rakish Paddy Group the list goes on & on. They also had a session in O’Donoghues singing a lot of Jerry’s songs that I was delighted to hear about. Hope you’re ok. Thanks for all your kind emails over the past weeks & for letting us use your wonderful tune dedicated to Jerry for his final farewell. We will miss you, and the sincerity and social conscious you brought us, Jerry. I will never forget the lessons of the bonsai tree or the family in the tenement. May you rest in peace and your spirit continue inspire the best in us all. These days, wild, crazy fun among architects involves Pecha Kucha style presentations. This is a high-speed format for sharing images and ideas. With Pecha Kucha, each presenter selects/provides 20 images. At the Pecha Kucha event, the slides are projected on a large screen in sequence for 20 seconds each. The presenter talks, and the slides move on wether or not the speaker is ready. It’s entertaining — in part because it’s actually quite difficult for the speaker to stick to the 20 second window. This format keeps the speaker from droning on too long and it leaves time for more people to present. It’s pot luck: everyone brings something to share and you can almost always find something you hadn’t expected but quite enjoy. An architect from Williamsburg, Dale Weiss, organized a Pecha Kucha event at ArchExchange East last November and he has uploaded the representations to his (very elegant) website. 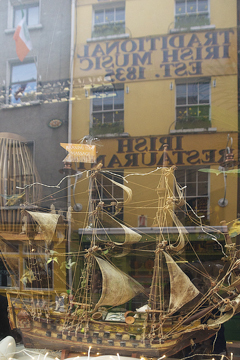 You can view my Pecha Kucha presentation, of urban reflections from Ireland, by clicking here. Kilkenny, Ireland is the home of Smithwick’s brewery. Nevertheless, Guinness is also a popular brew (despite the fact that it is brewed in Dublin). Here are a few reflections I found while pursuing the streets of Kilkenny last fall, with my mom. It’s vacation time of year here in Dublin, and friends are making a point of catching up with me before they go on holidays and I return to the States . It’s been such fun catching up with people I enjoy… like Eileen, Joe, Nancy, and Tom. Fulbright helped me connect with such interesting folks… teachers, scholars, engineers, linguists, musicians, and technology gurus… and that was just yesterday! Lunch at The Green Hen with Dr. Joe Dennehy. The Cobblestone with Dr. Nancy Stenson and friends. Piper Neil Mulligan, his son, and his brother Tom. Some of the Mulligans who played music at the Cobblestone last night. …a new character I met at the Cobblestone last night. 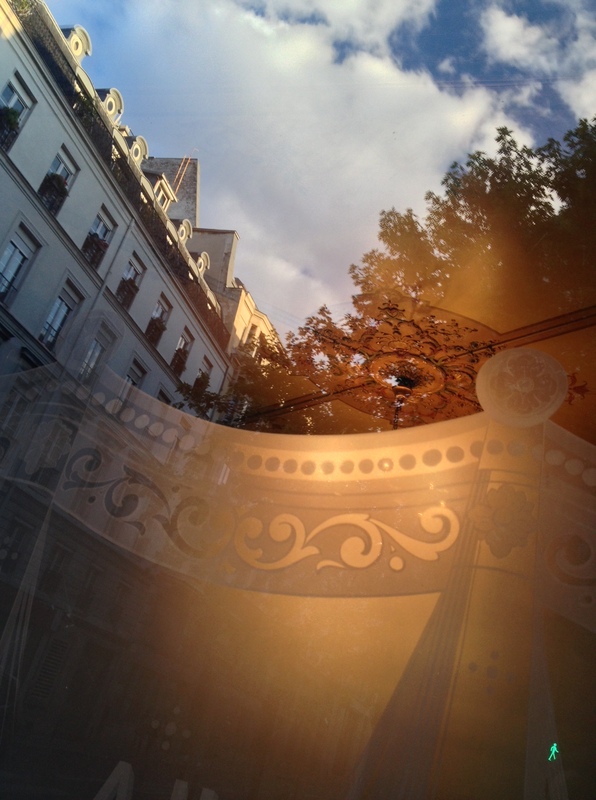 An evening reflection from Arrondissement 9 in Paris…. Yesterday, Joanne from the Fulbright Ireland office sent a number of links to news stories about the photo show. Unfortunately, tomorrow is the final day, and Joanne and I will be hard at work dismounting the work from the walls of O’Connell House. Joanne A. Davidson, the Fulbright Ireland Communications & Information Officer, just sent me the link to William and Mary’s website. Yesterday, they posted a piece about my exhibition on their main news page! WM announcement about photo exhibition. I’m posting the images from my photography show, for all of you who didn’t get to attend the opening and take a catalogue home. The title of the show is “Inter-Changes: Reflections from Dublin and Beyond” and it is on display at the O’Connell House at from 9-5 weekdays at 58 Merrion Square, in Dublin 2, from May 8-31, 2013. I’ll be there next Monday, May 27 from 12-2 for one last “Meet the Artist” session. If you’d like to purchase one of the works, please contact me via email at shannonchance (at) verizon (dot) net. The images are currently selling for 80 Euros or 100 dollars each, plus shipping and handling. The copyright for these images belongs to Shannon Chance. If you want to use them for commercial purposes, please contact me. You may use them for personal or educational purposes as long as you cite me as the author. My most sincere thanks to all who attended the launch of this exhibition. You have helped make my time in Ireland memorable and worthwhile! 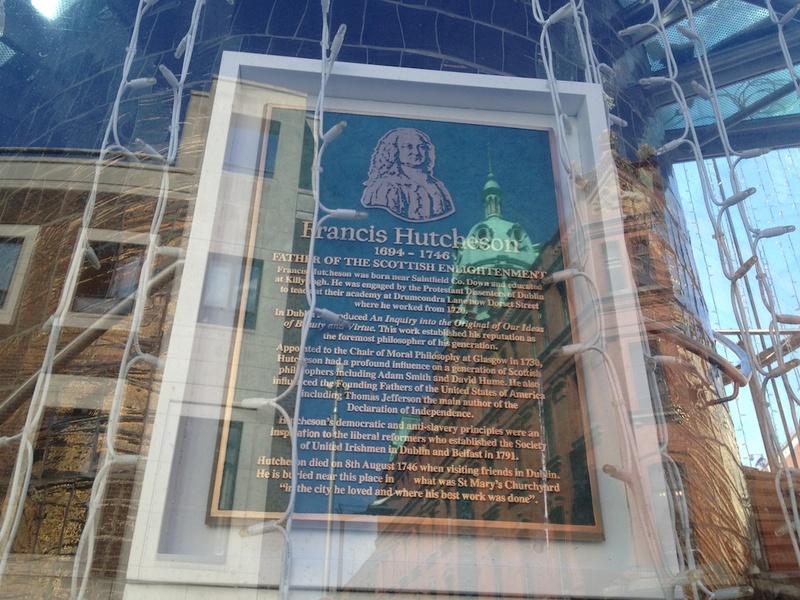 Thanks for reflecting on Ireland with me….